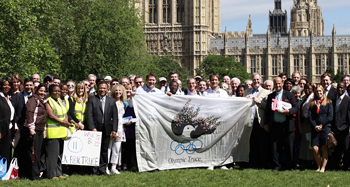 Lord Bates, who is the Chairman of the prayer breakfast, has walked 3,000 miles from Mt Olympus in Greece – the site of the Ancient Olympic Games – to London to raise awareness of the Olympic Truce. The truce is intended to bring an end to war during the games. It guaranteed the safety of competitors, officials and spectators as they travelled to and took part in the Ancient Games. Lord Bates believes for the modern Games it could be used to pause the fighting and allow humanitarian aid into conflict zones around the world. After the Prayer Breakfast nearly 100 supporters joined him for a prayer walk from Westminster to East London. They prayed for peace along the route and at a Catholic church, Our Lady & St Catherine of Siena, close to the Olympic stadium. Though it was kept for some 1,200 years during the Ancient Olympics, the Olympic Truce has never been fully implemented for the modern Games. Some 700 Peers, MPs, church leaders and representatives from charities attended the National Prayer Breakfast, where Lord Bates asked them to pray for the Olympic Truce. He said: "We have to let London be a start, to light the flame for a re-discovering of what the Olympics was all about, and take that flame to Rio and beyond. "I am praying that this will be the start, when we take the Olympic Truce seriously," he added. "That is well within our grasp." Former paralympian, Baroness Tanni Grey-Thompson (left), also addressed this year’s breakfast in Westminster Hall. She said that the ‘wonderful atmosphere’ that had been created by the Olympic torch relay needed to be continued beyond the Games. "In the challenging times that we live in, we need people to pull together," she said, "and the Olympic values are about that." Bishop of London the Rt Revd Richard Chartres told those attending the breakfast that the Olympic Games provides a unique opportunity for people throughout the UK to play a crucial role in ensuring its lasting legacy. He said, “Part of the challenge of the Games will be ensuring that they are not merely a great commercial spectacle for elite athletes, but inspire us all in our own ways”. The prayer breakfast, held once a year, is part of the work Bible Society is doing with Christians in Politics to ensure the Bible message is heard at Westminster.